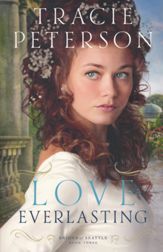 Love Everlasting is the third book in Tracie Peterson’s Brides of Seattle series. Peterson tells the story of Abrianna Cunningham who has grown up in a bridal school in Seattle in the late 1800’s. While having much experience in preparing for wedded bliss, she lacks the certainty that marriage is the course her life should take. She loves Wade Ackerman, but is afraid that her commitment to him will take away from her purpose in life. Another suitor, Welby, is after Abrianna’s affection. Welby is determined to have his way and uses his power to force Abrianna’s hand. First let me say the attempt of Peterson to tell the back story of this novel in the first chapter left me thinking I likely should have read the first two books. I felt lost and a little like I was drinking though a firehouse trying to get caught up. Secondly, for most of the book I was a bit annoyed by Abrianna’s wishy-washy personality. I tried to keep in mind that her character was written to be such to make the story make sense, but many times I felt she needed to get over it! She exhausted me!! However, I did enjoy the way Peterson gave Abrianna a mind of her own. Abrianna is a strong and determined woman and I can always appreciate that character trait. I also appreciated the overall plot of this book. Peterson includes enough conflict and excitement into Love Everlasting to keep me turning the pages regardless of my feelings for the main character. Overall, this hasn’t been my favorite fiction read this year, but I did enjoy reading it. I was given a complimentary copy of this book by its publisher in exchange for an honest review. I have not been compensated and all opinions are my own.